Custom veterinary notepads are brilliant promotional choice for veterinary services because it offers more than just shoving it down the throats of potential clients! No matter how good your veterinary services management skills are but maintaining a loyal customer base is always difficult. With growing awareness about veterinary services and animal care, it is increasingly becoming difficult for the businesses to maintain their visibility for a long time. Promotional veterinary notepads imprinted with suitable business information allows these veterinary services to remain in visibility and maintain their loyal customer base too. 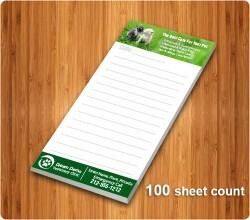 Personalized veterinary notepads can be offered during pet shows, after a pet’s service or they can be employed for building referrals. Veterinary clinics, veterinary service managers and private veterinary service individuals can find success by utilizing these specialized notepads for promotions because their clients are going to love them for the sizeable scribbling space that they offer!